You've been here before-hell Tribeca was here last year with the SURVIVALIST which is almost the exact same film as this except this has zombie stand ins. To be honest not only have you been here you've seen similar tales 900 times before. If you like post apocalyptic zombie like stories you've seen this, except here not a hell of a lot happens. 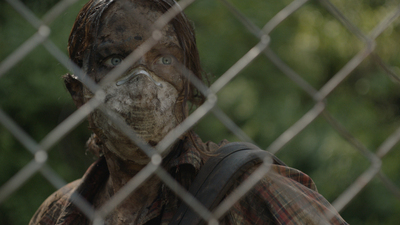 The plot has a woman living alone in the woods after a viral outbreak has caused society to collapse after the the infected turn violent and blood lust filled. Think of them as zombies. Into her life comes a girl and her step father and the group kind of forms a family...for a while. This might have worked if the film had stayed with the woman alone in the forest but the inclusion of the zombies just starts this going on a road we've all seen before. For a while it still works thanks to a refusal to see the monsters until the end- but then they show up and the film gets silly. If the slow pacing and feeling we've seen this before wasn't bad enough, the film deteriorates from logic problems more and more as it goes on. The biggest problem comes from the constant raiding of the same house for food over and over again. Why the same house? More importantly why does it have chain link around it and why are the beasts there? We could take it further and dismantle the climatic scene but that would be telling you too much- but lets just say it makes no sense- none. Glacially paced this film will try your patience. There were all sorts of technical problems during the screening as if the projector was rejecting the film. You can skip this one because you've seen it all before.